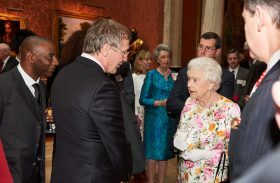 Francis Toye, founder and CEO of The Unilink Group and Derek Jones from Unilink Technology Services were honoured by Her Majesty The Queen with the Queen’s Award for Enterprise in Innovation. The event took place at the Buckingham Palace on Thursday, 14th July 2016. 16/12/15 - Excellent Guardian article on Thameside prison HERE. Like all private prisons they use our prisoner self-service. 16/09/14 - Please ensure you have quoted the correct NOMS number when sending in deposits to your recipient. If the payment is allocated to another person’s account in error, the prison may not be able to transfer to the correct account at a later date due to the funds being spent. 30/06/14 - Please be aware that some establishment do not allow you to send funds to unauthorised recipients. If you are unsure please check with the prison concerned, they will be able to confirm who your authorised recipient is. Not doing so could result in suspended payments. Thank you. This service enables you to send money to prisoners in the UK that operate our service from any computer. Secure Payment Services is a safer, faster, more secure way to pay online with, your payments sent directly to the prison. Thank you for using Secure Payment Services. We appreciate all feedback to ensure we continue to offer the best service possible. We will send all payments to the establishments at the allocated times over the Easter Bank Holiday. However, some establishments finance departments may not be available to allocate the payments. These payments will be allocated to your recipient's accounts on their return after the Bank Holiday. Please note - Our offices will be closed between 19th - 22nd April 2019, you will not be able to contact us by telephone. Please contact us via email support@unilink-technology-services.com and we will respond on our return.